Rose and the Singing Bagels is the story of how Rose Marino joined Los Bagels, fell in love, out-smarted a tail, helped her little sister Maggie, played matchmaker more than once, taught her students, tended to Eden, and baked bagels, not necessarily in that order. This is a light, sweet, clean contemporary romance with lots of heart, more than a bit of which comes from the hyphenated Italians in this tale. 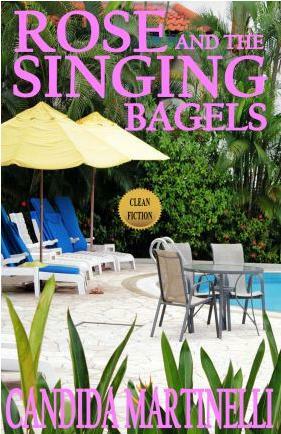 This sweet modern romance is chock full of matchmaking and happy endings for everyone concerned, with the exception of the obligatory ogre, who gets his just desserts while the happy reader develops an inexplicable craving for bagels. (Rose Marino) "Simple pleasures filled Rose's life, and she was sure she was missing nothing. A sense of contentment filled her most moments of most days. Was Rose gorgeous? Was she Eve in the garden of Eden? Was she a beauty to rival a model or young Sophia Loren? No, not really. Rose Marino was a natural beauty; trim at forty in her pink sweats; curvy where a woman should be curvy; her thick, long, dark hair held back by a clip at the base of her neck. Rose's interesting face spoke of her Italian heritage..."
(Alex Devincenzi) "For Professor Alex Devincenzi, a dark-featured, lean forty-two-year-old, the day had begun even earlier than Rose's day. Alex was a very early riser, who often liked to begin his days hiking along trails in a nearby national park. He was Maggie's accounting professor, and he dressed as one would expect a hiking accounting professor to dress, in a casual, laid-back style that was clean, neat, within the lines, adding up to what he was, which was a man who liked his life tidy, and above all honest and sincere. "All those traits made Alex a man whom many women found difficult to deal with, since modern lives, especially the lives of modern women, were rarely neat, tidy, and between the lines. The women were also too often lacking in the honesty and sincerity department, at least that was what Alex told himself, often, usually while hiking, alone."